Does anyone know though why different cancels were used for these? Also, where did the CTO work take place? was it actually done in Liberia or elsewhere and then sold on to dealers? I'm sure Manfred has a lot on info on the CTO cancels. As far as i know the CTO's were not done in Liberia. CTO's were put on stamps to make them sell for less than mint stamps. Liberia was one of the leaders in selling CTO stamps. Albert is right, the early CTOs were all done in England (according to Cockrill). 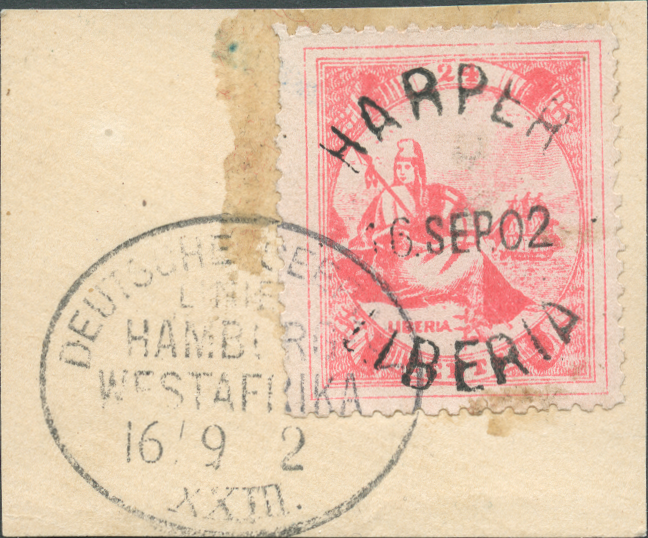 Although I have no proof I am convinced the first stamps that were canceled to order in Liberia were the ones printed in Berlin. Not by Liberian officials, but by employees of the company that had the contract, J.W. West. Just a guess, but at least that would make sense to me. I've always assumed that CTOs were done to raise extra revenue by selling to collectors but has anyone any information on how much revenue might be raised this way? Not sure how much money was done by selling CTO. I do know that after 45 years of collecting Liberia i see more CTO sets than mint sets. Every collection i see or every stamp set the used is always CTO more than mint or more than postally used. As a kid in the 1950's the first set i got was CTO. Liberia was one of the leaders in selling CTO stamps. Maybe Manfred has more info on this CTO issue. same quantity as above O.S. I wonder what they sold for back then? I also wonder how many Liberia collectors there were in those days - probably more than today! I should have added that the note is dated from December 1912, three years after the stamps were issued. I assume Hayman placed several orders like this over the years (with the early ones probably being even bigger), and the fact that he placed this one means that there was a demand. In those days the average stamp collector who had an interest in exotic stamps from overseas would collect everything he could get his hands on. The stamp market just wasn't glutted yet like it is today. I always thought that Waterlow & Sons made the first CTOs. And, I had always thought it was all Henry Hayman's idea. I forgot where I picked this up. It all started in the early 1890s. Used-stamp collecting was very difficult at that time as most international mail was addressed to businesses, lawyers or government liaisons. And that's why so many stamps were cut/soaked off covers unfortunately, as no one yet collected postal history. But lawyers etc. saved correspondence. At this time also, stamp dealers got involved and started creating philatelic covers. Postal history buffs want commercial covers because the rates will be correct. It is the massive amount of Liberian CTOs combined with the many (misunderstood) 1910-1920 overprints that really put-off the serious stamp collectors, and gave Liberia a bad name during this time, and Liberia dramatically fell out of collecting favor. Liberia received a lot of bad philatelic press in the mid 19-teens, primarily in Britain if I remember correctly. As an aside, I know the Australian PO made CTO cancels in 1914 (I collect Kookaburras) that were sent as specimens to the UPU and those are very scarce and highly collectable! I avoid the Liberian CTOs, but have collected some forgery cancels. In my opinion, the first Liberian-made CTOs were done in 1897-98 on the 1880 Issue extras. All using PO handstamps. I have a ton of these, especially the 12c and 24c stamps. There is no reason for them to be used during this time. Likely, since the Waterlow CTOs were so successful, the Liberia PO wanted-in on some action themselves. I did a little study on these a few years back. There are many with the same date, and many within same weeks... all nearly perfectly socked on the nose. I'm sure you've seen these. One stamp has a partial cancellation due to a fold in the sheet across the stamp, almost proving it was CTO. I could paste in a few pictures if you want. 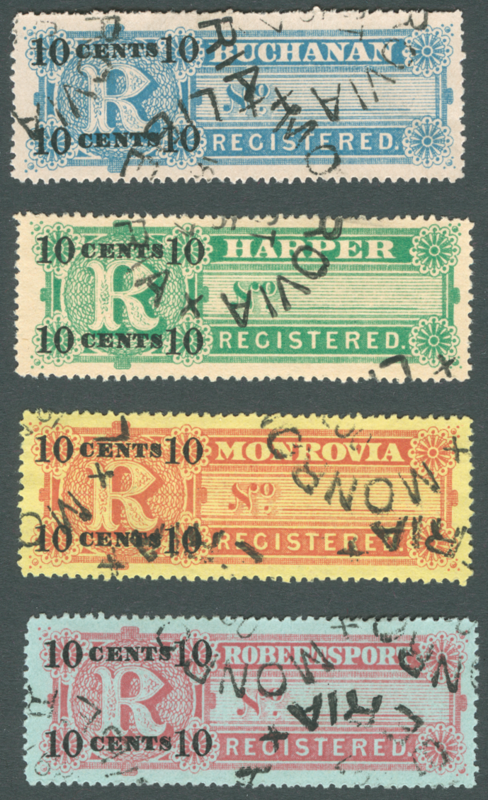 "Cancelled-to-order and forgery cancellations on the 1880 first issue fifth transfer printing". Anyway, if the 1897 to '98 cancels on the 1880 issue indicate CTO, the postage due stamps J3/J9 and the registration stamps/labels F6/F9 with '97 dates are probably CTO, too. I had always filed these under favor cancels, but in the case of the registration stamps the CTO character of the postmark is quite obvious: they didn't even use matching town cancels. Yes, these registration stamps are so narrow that when they stamped the sheets this is exactly what I would expect... 4 or so partial cancels. I had not seen these or looked for these before.